Rava Wines is nestled on a 505-acre boutique vineyard in the heart of Paso Robles wine country. Whether you are looking for an intimate ceremony by the lake, celebrations in our olive grove and old world courtyard or sizeable corporate gatherings in our indoor ballroom, we can encompass all your needs. 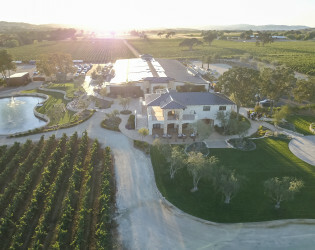 Rava Wines is nestled on a 505-acre boutique vineyard in the heart of Paso Robles wine country. 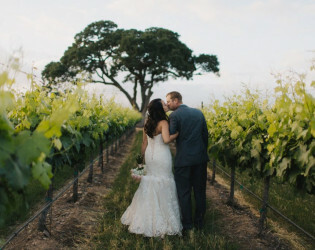 Once home to a working horse ranch the venue offers a unique blend of the scenic central California coast. 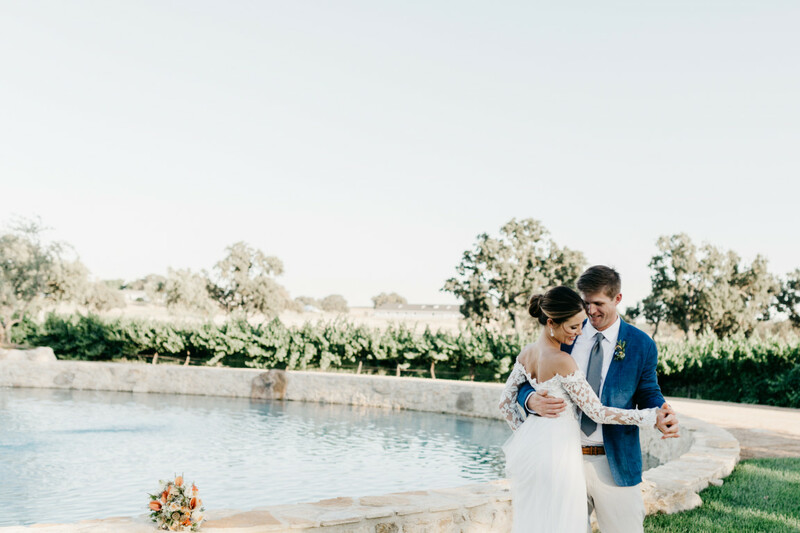 Whether you are looking for an intimate ceremony by the lake, celebrations in our olive grove and old world courtyard or sizeable corporate gatherings in our indoor ballroom, we can encompass all your needs. 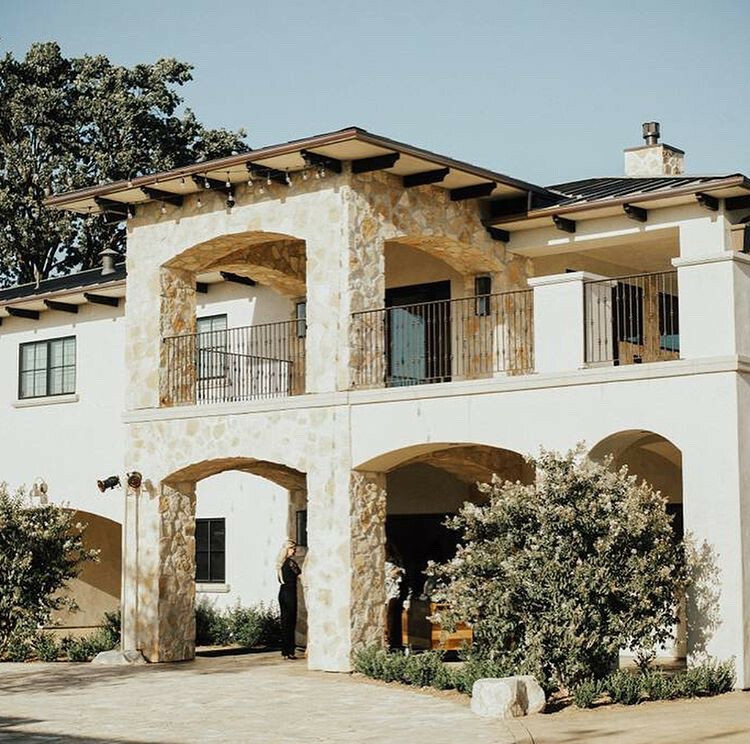 Villa Giada provides luxury accommodations onsite, making Rava Wines your full-service destination. 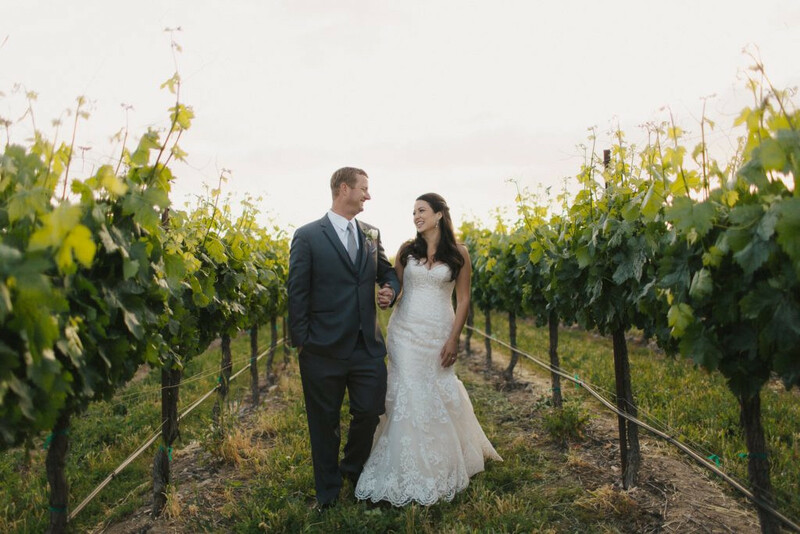 We look forward to personalizing your experience to create lasting memories with family and friends. We require additional security deposits to rent the venue. Along with a minimum wine purchase. Villa Giada is a private three bedroom luxury home above Rava Wines boutique tasting room. 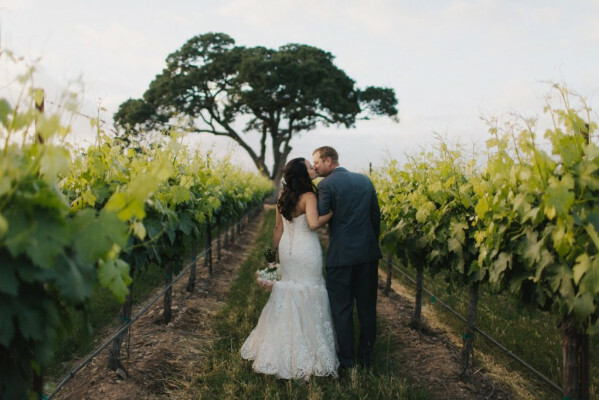 The villa overlooks endless miles of beautiful vineyards and oaks. 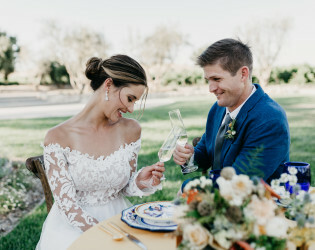 Villa Giada was established in 2017 and provides full amenities for its guests. 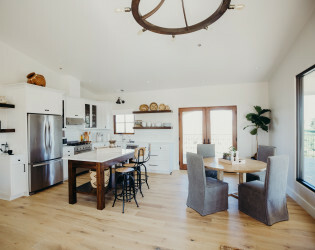 It is a short ten-minute drive from exquisite restaurants and boutique shopping, in the heart of downtown Paso Robles. 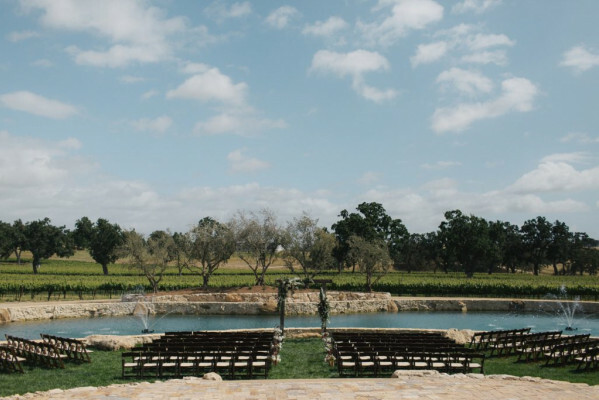 Just five miles from historic downtown Paso Robles, you and your guests will escape down the vineyard-lined driveway to a 504-acre private estate. 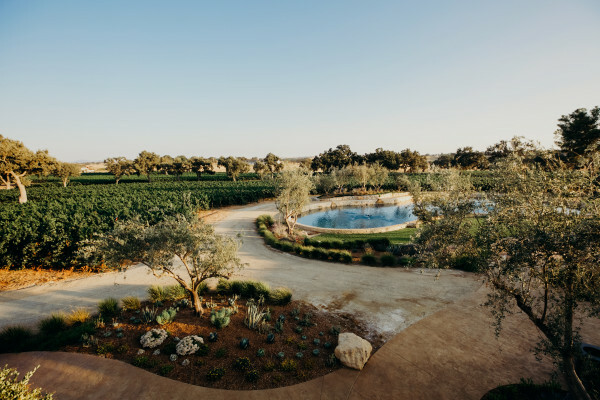 Once home to a working Arabian horse ranch, Rava Wines has been refurbished into an old world yet modern California vineyard estate. 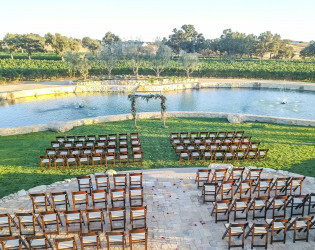 Lush landscape surrounds five venue locations including; The Terraced Pond Lawn, The Old-World Courtyard, The Vineyard Lawn, The Olive grove and The Ballroom. 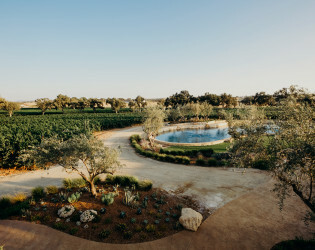 The property boasts 188 oak trees, 100’s of olive trees, two ponds, estate cattle, rolling hills and luxury onsite accommodations. The property is 100% family owned and operated. Old world California meets modern vineyard style. Villa Giada provides 360-degree bird's eye view of the estate, including a 100-year-old farmhouse! The interior is a luxury, yet earthy retreat with copper fireplace and reclaimed furnishings. The bridal suite is complete with mirrored barn door, Juliet balcony, and modern volcanic stone soaking tub. California Native American Artwork is displayed throughout the Villa. 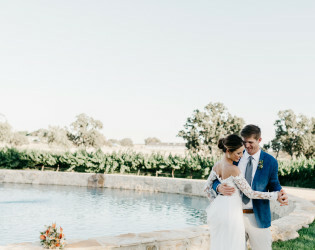 The Indoor ballroom features polished concrete floors, clean contemporary design and warm 20’ barn doors. The same barn wood was thoughtfully used to design bars and trash receptacles. You will find copper accents throughout the property. 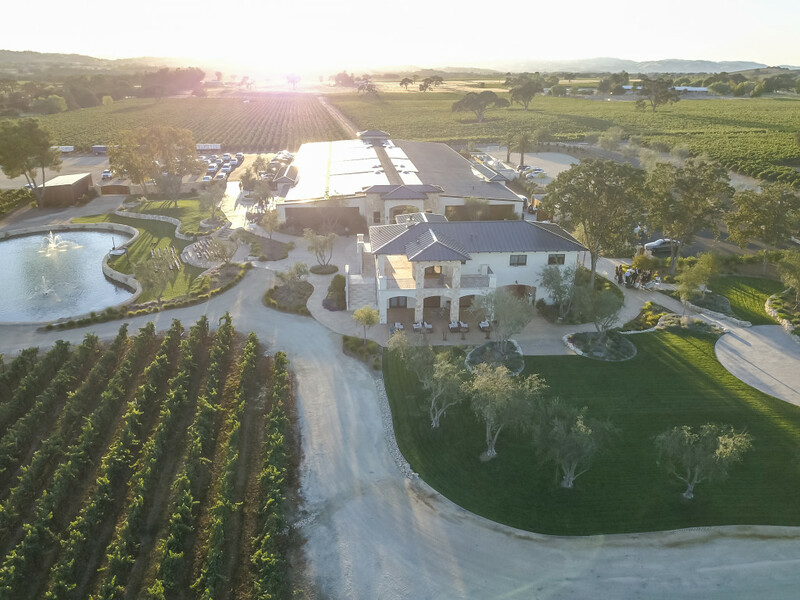 Rava Wines is proud to be 100% solar powered! We offer a private gallery featuring neon artwork from famed London artist Tracey Emin, one of three in the world. 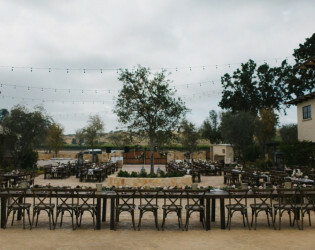 Guests will enjoy outdoor lounge areas, bistro lighting, and a bocce ball court. We produce methodé traditionelle sparkling wine from our family owned vineyards, made on site at our winery and available to serve at your special event. Functional amenities include landscape lighting, indoor audio video, electrical throughout, outdoor dancefloor, onsite parking, ADA access, plentiful restrooms, catering prep kitchen, indoor heating and air, ice machine, walk-in refrigerator/freezer, and hidden vendor access. Mercedes sprinter van, horseback riding and yoga available to guests (Pricing and availability by request). 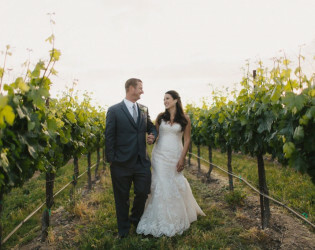 Rava Wines provides additional benefits available for use by our guests. 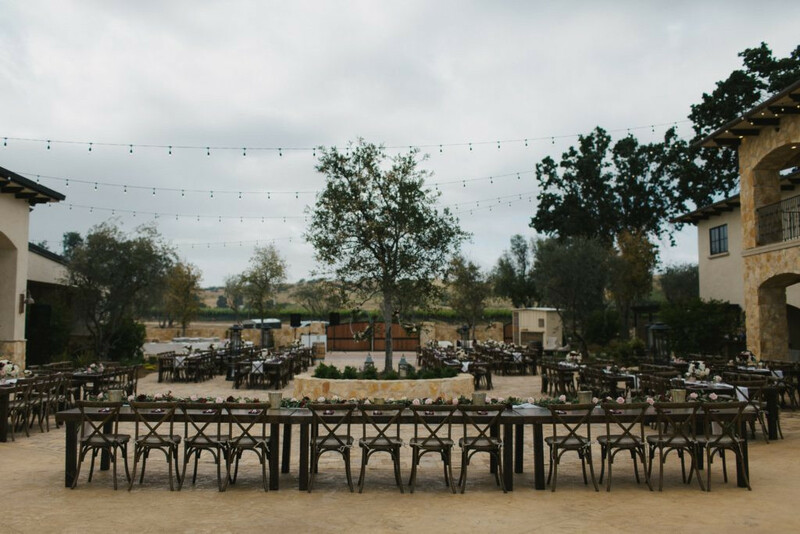 Guests have access to our beautiful 8’ X 4’ wood farm tables, rustic cross-back chairs, wood folding chairs, and 72” roundtables. Our portable barn wood bars are perfect for any event indoors or outdoors. Create a bold & unique backdrop, in front of our state of the art photo booth. 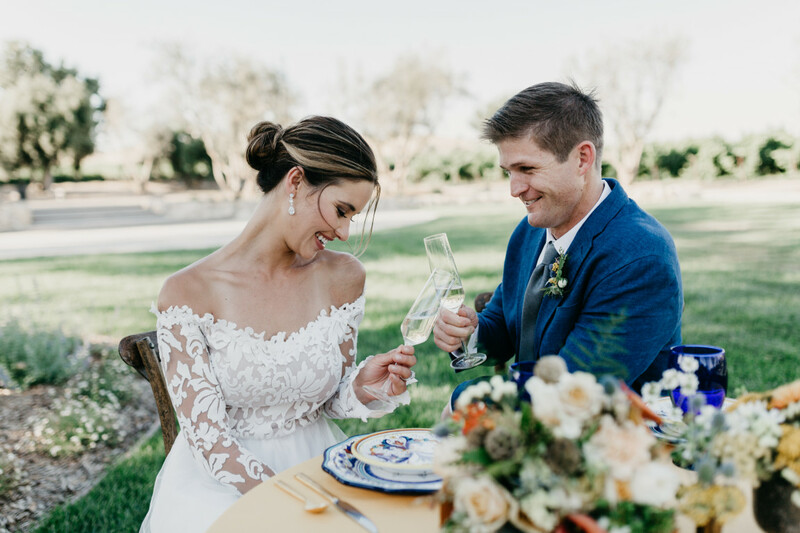 Escape to a dinner, sipping wine under the stars surrounded by an old growth olive grove and bistro lights. 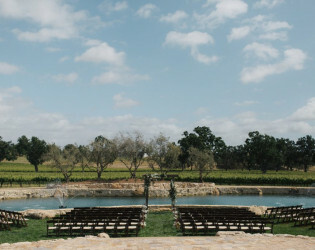 Malbec Vines and 100 year oaks dot the landscape for a sunset ceremony or reception under the stars. 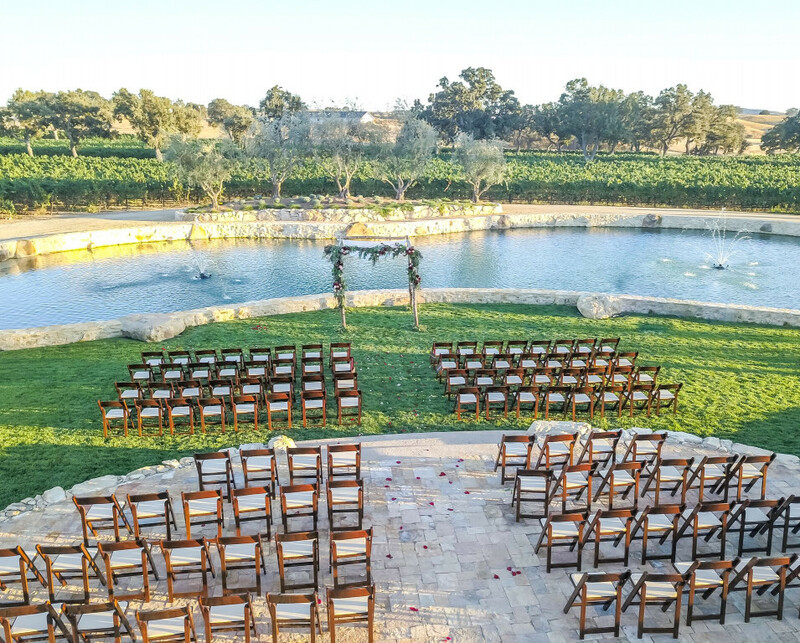 Imagine an intimate ceremony by the pond surrounded by terraced landscaping. Step into another world with handcrafted Mexican pavers circling a mature live oak tree during cocktail hour. Maintain all the feels of nature while celebrating in comfort. Enter through 10’ double doors into a spacious lobby. 10,000 sq. 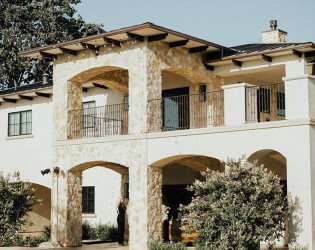 ft. of indoor space awaits with views of vineyards, oaks and lake. 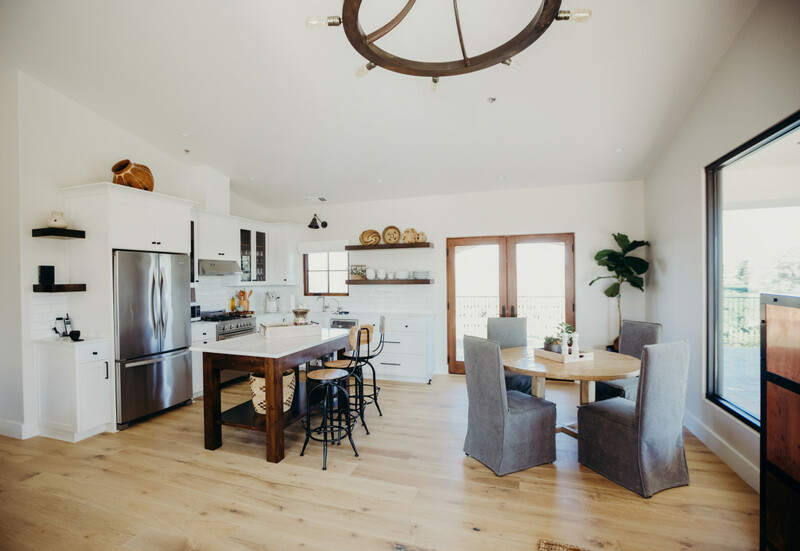 The environment is clean and contemporary yet provides old world warmth with 14’ modern barn doors, custom chandeliers and polished concrete floors. 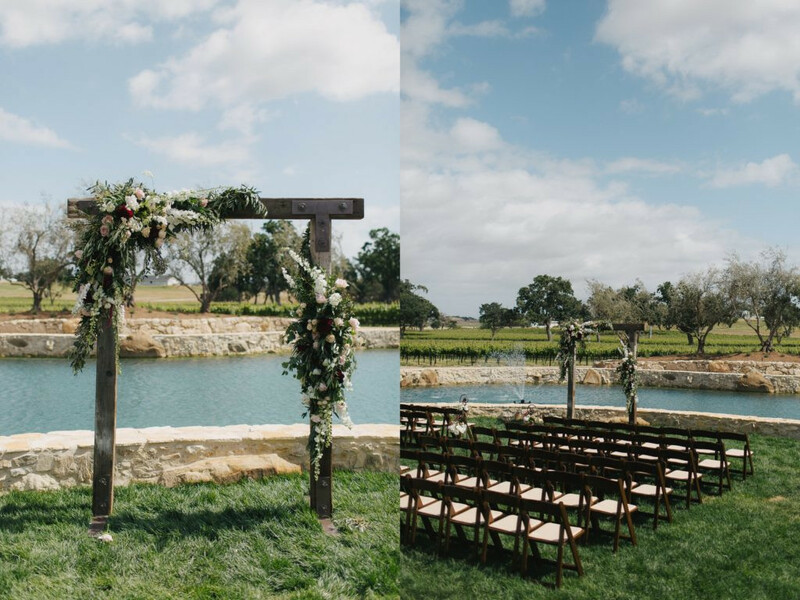 Includes use of folding chairs, rustic-cross back chairs and farm tables, two portable bars, stage, projection screen and catering kitchen.